At the 2018 US Open Final, Serena Williams and umpire Carlos Ramos were involved in a heated verbal exchange during after the star player was penalised for her loud on-court ourburst and points were deducted from her score. One of the charges Serena faced was of on-court coaching, which is banned in the US Open. Williams was fined $17,000 for three code violations. She also called the umpire a "thief". 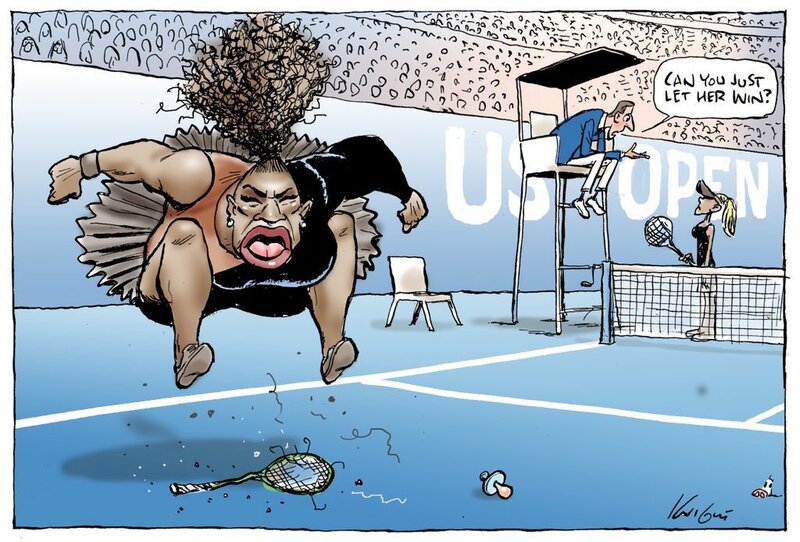 So, a leading Australian cartoonist Mark Knight came up with a cartoon to criticise Williams behaviour. It was published in the Sun Herald. He poked fun at the tennis star for losing her temper in the final! However, this cartoon by Knight (@knightcartoons) was instantly banned by Twitter for "going against their terms". While some deemed the cartoon unflattering or even cruel but many people see no racist angle in the context of political cartooning. So, what's your opinion? Share your views in the comment box. The Sun Herald has defended Knight. I even read in CNN quoted Serena as saying: "I am here as a black woman..." Is she trying to become a victim again? Sad sad sad... Maybe later she only was made aware that Noami Osaka is also a Black Asian with a black father. What a shame she is.